The big challenges standing in the way of a full frontal assault on petroleum by the clean energy industry are the cost of production and a dearth of ways to store the energy after its produced. 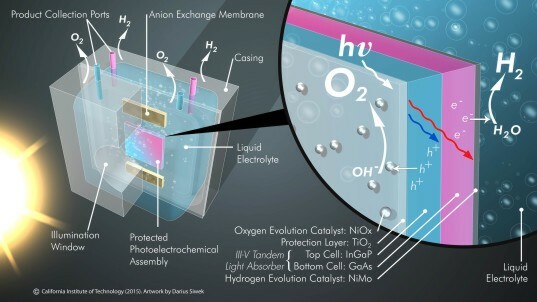 But a team from Caltech’s Joint Center for Artificial Photosynthesis (JCAP) came up with new technology that could bridge that gap: an artificial leaf that mimics the process of photosynthesis by plants. The artificial leaf efficiently produces and chemically stores energy using nothing but the sun’s rays. Artificial photosynthesis isn’t new, as the concept has existed since 1912. It has been researched ever since, but as with many renewable technologies, the cost of production has always been too high. Finding materials and creating a stable system have also been major challenges. After five years of work, JCAP has pioneered new technology that can bridge the gap, creating a process that’s not only efficient, but also stable and cost effective. The demo setup produced by the researchers is capable of converting 10 percent of the energy it absorbs from the sun into energy stored in its chemical fuel – and can operate for more than 40 straight hours. A map of Caltech's new artificial leaf technology.